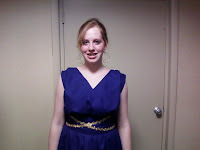 A student in a lovely blue tunica. 1. The high school students dressed up. Seriously, they had a toga fashion show. 3. They declaimed the Pledge of Allegiance in LATIN! 5. They were bright and funny. 6. They got my lame jokes. Sneakers with a toga? A kid with my sense of style! 8. They knew their ancient history but I still managed to surprise them with the odd factoid and/or story. 10.They seemed genuinely interested in what I had to say and wanted to know why they couldn't get my upcoming novel, CLEOPATRA'S MOON, now. The director mentioned the possibility of having me come back and speak to the kids again. Um, YES! Please? yAYE!!! Oh how I LOVED this post! I am so *glad* you got to go to the JCL conference! I fondly, fondly, FONDLY remember my yearly conferences with the AJCL....some of the happiest memories of my high school time! We used to sing the Gilligan's Island Theme Song in Latin, and there was a contest a coupla years to come up with the *best* "contemporary latin phrase" (ex: How much is that toga in the window, My place or yours? etc.). 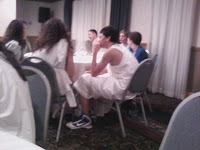 Plus the sneaker-toga combo.....WHAT A GREAT LOOK! Thanks for sharing. HISTORY GEEKS UNITE! Sounds like you had a great experience. Hope you told your daughter about all the kids dressing up. Ha. And seriously, I can empathize with those students: Why CAN'T we get a copy of CLEOPATRA'S MOON? LOL. Great work Vicky! Your untiring and enthusiastic efforts to make history fun and accessible for youngsters is inspiring to behold. That kid with the toga/sneakers combo is definitely onto something! I want that look to come into fashion NOW! Also, thanks for listing me in your blog-roll! My son is a techno geek but finding your 'people' is exciting and accepting in any forum. It sure looked like a lot of fun. Thanks for your kind comments, guys. I love being a history nerd! very cool. I loved the comments you overheard. What a great experience, Vicky for them and you! I had a great time with younger students in West Virginia in Nov. :0) Love the togas.